Things are really starting to move with my theater!! i just found out that a big chunk of my funding is coming through next week!— hooray! one of my tasks this week is to look in to my carpet— i’ve decided to go with FLOR carpet tiles, not just because it is a great product, but for the amazing commitment the company has to sustainability— they are actually a carbon neutral manufacturer, and they have a new initiative, climate takeback, to prove that companies can even be carbon negative! i am wondering if maybe they would sponsor me?? guess i got a letter to write! then i can bring lots of my puppet stuff and the basics for camper life— i can also bring the panels jared will make for my doors and steve can mount them! i’ve hit some speed bumps in the last month or so— but, i have decided on my truck! 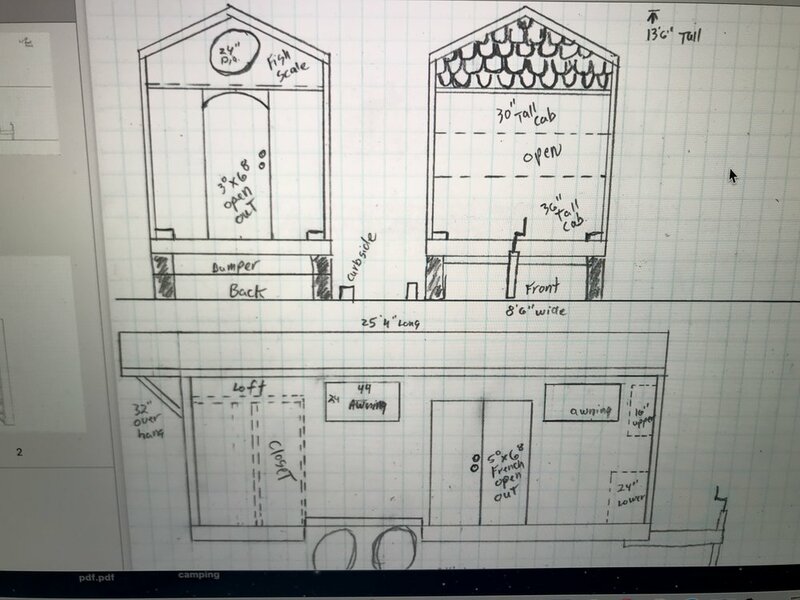 and my trailer is ordered and being built right now!— it will be finished in a couple weeks and they will start working on tiny house theater for real!! a couple weeks ago i finally made it out to salinas to visit the commercial truck dealerships for ford and dodge— it was a great experience! it’s only a couple months till i’m in colorado with steve and cheryl of tiny diamond homes to finalize the plans for my theater design! i’m already thinking about paint colors, roof color, door color, floor color, truck color— because i love color! but a couple years ago i got them out and put them up along the top of the desk hutch and the armoire in the family room, and somewhere along the way i decided i wanted them in my theater— they are simple, warm, comforting, and magical— and that is a pretty powerful combination! i got my plane ticket, my airbnb, and my rental car! we’ll have two whole days together to dream and sketch and get super excited about this amazing project! along the way here, i’ve done some sporadic, fitful poking around about the truck i’m going to need to make all this go, literally! i’ll let you know what i learn! at first it was just a tiny house on wheels, but somewhere along the way, i began to visualize a tiny house traveling puppet theater! then, in december, 2017, i had an epiphany, thanks to a christmas card from my cousin, about separating the living area into a truck camper and having the entire trailer be the theater! this past summer, in august, 2018, on the way home from puppet boot camp, i visited cheryl and steve! things are getting serious between us!— cheryl and sharon, her assistant, are creating a file for me and my dream of a real tiny house theater! wildflowers at chautauqua park in boulder, colorado— i got to spend some time exploring the gorgeous trails here when i was in boulder for puppet camp. my first tiny house theater blog post! “Once upon a time, there was a little girl who believed in magic. She colored magical worlds with her crayons. She built houses for the fairies in the sandbox. She went on magical treasure hunts in the forest, and she talked to the animals and the trees. Many times she was told that magic wasn’t real, and as she got older a strange thing happened: slowly she lost her way to the magic inside her. Then the girl grew sad, and she stopped coloring and talking to the trees. But the magic was always there inside her, just waiting. The girl became a woman, and one day something amazing happened. The woman saw a puppet show, and all the magic inside her came alive again! The woman began to sew colorful quilts, and she planted a garden. She wrote stories and made puppets of her own. She began to share her love of nature, her stories, and the magic inside her through her puppet shows. And she had a very magical idea! She wanted to have a tiny house puppet theater that would travel the land, bringing magical stories of nature, wonder and imagination to all. I wrote this at the final, 4-day writing intensive for my year-long “Walkabout Tales” writing course with Suzanne Down and Juniper Tree Puppets. Christine Summerfield came and gave us a day-long presentation on writing a blog and it was just the inspiration i needed to get me going on the blog I have been wanting to start for awhile.